Bubble tea (also known as pearl milk tea, or boba-milk tea) is a Taiwanese tea based drink. Bubble tea has now spread to many parts of the world and is very popular among the younger generation. Chewy Tapioca pearls are added to these drinks. There are many types of flavored teas and pearly drinks with ice cream floats now. Many American bubble tea vendors here sell “milk smoothies”, which are very similar to bubble tea but do not contain any tea ingredients. Tapioca balls (boba) are the chewy tidbits in bubble tea. Green pearls have a small hint of green tea flavor and are chewier than the traditional tapioca balls. 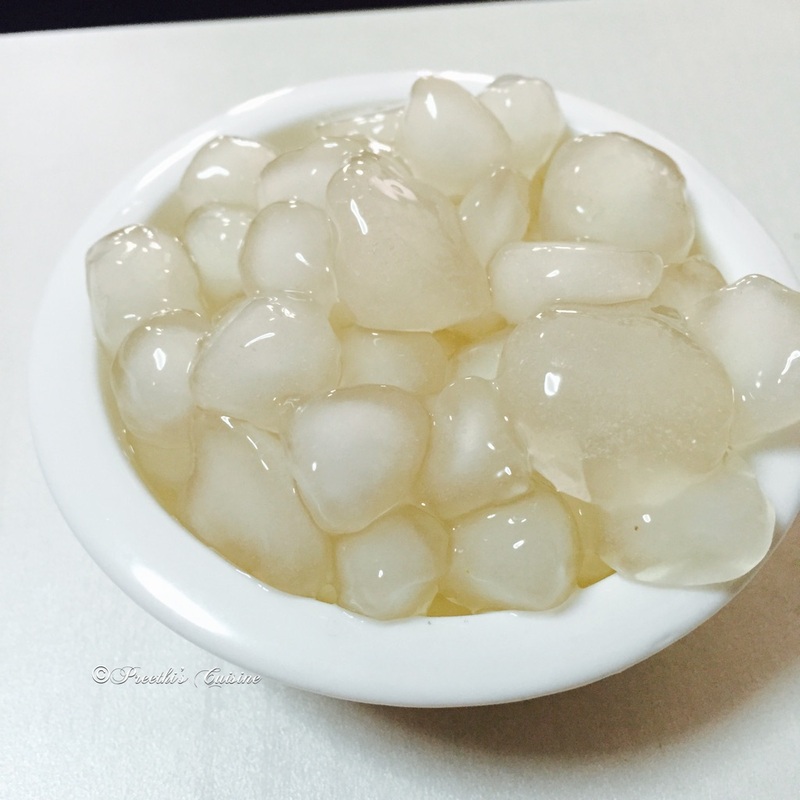 I have tried to replicate these Tapioca pearls at home as my kids love these. 1 Cup is 250 gms. Mix sugar in the water and keep it on medium flame until the sugar is fully dissolved and the quantity of syrup is reduced to ¾th .Switch off the flame and keep it aside. Take the Tapioca Starch / flour in a bowl. Add ¼ th cup of sugar syrup and mix to form a dough. Add a little more syrup if necessary.It will not be like the normal dough. Switch on the flame and heat the balance sugar syrup. Make small balls approx 1 cm and drop it in the sugar syrup.Do not press the balls while you shape them as they may break.You need a lot of patience. Let the balls boil in the sugar syrup for 25-30 mins and switch off the flame once you see the transparent pearls. 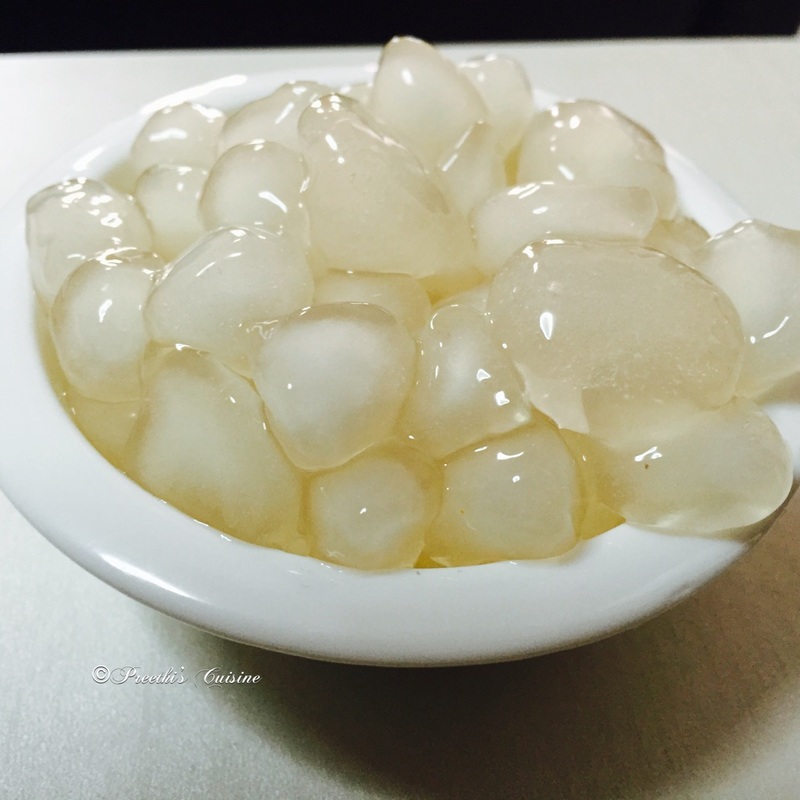 Remove the transparent pearls from the sugar syrup and put in a bowl filled with ice. This is to ensure the pearls don’t stick to each other. These pearls can be stored in the fridge for 2 days in an airtight container. I prefer not to keep it for long. Add it to milk shakes, Smoothies, Cold Tea with or without milk, Soya Milk, Milo. Enjoy your drink with these lovely chewy pearls!! PS:You can try with half the quantity for the first time. Brilliant, love this! It sound so simple! Wow,what an innovative brain. !I love the. Pearlsincool soya milk andmilk shakes. Nice idea.. we make Sindhi kheer with tapioca pearls too. Thank you Shobha ji.Good to know you use it in Sibdhi kheer. Tapioca pearls are very versatile in their usage as you have mentioned. I loved how beautifully you have explained the entire process to create these pearls. Very nice dear Preethi. I see bubble tea in restaurants – it would be really cool to be able to make it myself! Thank you! Welcome Anne. Glad you like it. Great recipe and really explained well!